How did Peppa Pig become a bootleg Chinese style icon? Peppa Pig, the animated kids’ character with the head shaped like a hairdryer, seems a pretty innocuous figure. Sure, she can be pretty bratty to her parents and isn’t afraid to serve the sass to her friends (that phone call hang-up is iconic), but her squeaky voice and little red dress hardly suggest anything more than childish innocence. Peppa Pig is designed for kids, after all. So why are her rosy cheeks suddenly popping up everywhere in bootleg brand collaborations featuring the likes of Supreme, Balenciaga, Off-White, and Gucci (and, TBH, pretty much any other popular brand you can imagine)? The anthropomorphic animation has been blowing up in China since it first aired there in 2015, presumably to the delight of producers Astley Baker Davies. What the show’s British creators probably weren’t banking on, though, was finding fans in members of the country’s Shehuiren slacker subculture, made up of anti-establishment, mostly working class youth. Ah Pang is the blogger credited with sparking the Peppa Pig craze in a post from last October, in which he cited her family’s detached house, multiple cars, and even Grandpa Pig’s personal boat (!) as indicators of their wildly rich lifestyle. In other words, this bourgeois little piglet was ripe for co-option. Fast forward to late April and the widely-reported deletion of more than 30,000 clips on the popular streaming site Douyin, where people had posted short, subversive video edits that transformed Peppa into a gangster icon. The Global Times, a tabloid offshoot of the State-run People’s Daily, declared the creators of such videos to be “unruly slackers roaming around and the antithesis of the young generation the Communist party tries to cultivate.” But it seems that the swine censoring came too late; the pig’s influence had already seeped out into fashion and trends. Alongside memes, the show’s popularity spawned masses of mostly-unofficial merchandise not only for children, but for adults too. This includes candy-dispensing watches (worn here by popular singer and actress Qi Wei), an antique-style porcelain cup, and temporary tattoos. These tattoos have been particularly popular amongst the Shehuiren subculture, whose members post images of matching faux tats across social media, spawning a viral phrase that approximately translates as “get your Peppa Pig tatt, shout out to your frat”. And while on the topic of body modification, the university student that got Peppa’s outline shaved into the back of his head is surely worth a mention. This brings us to the bootleg collaborations. In March, a series of pictures appeared on Weibo, one of China’s biggest social networks, combining Peppa Pig and the logos of various premium brands. In one image, her head replaces the R in Supreme; in another, her snout pokes between the two Cs of Chanel’s emblem. The first logo is a particular favourite, though: the horse-and-cart of the Hermès insignia is replaced by a smiling Peppa on her bike. 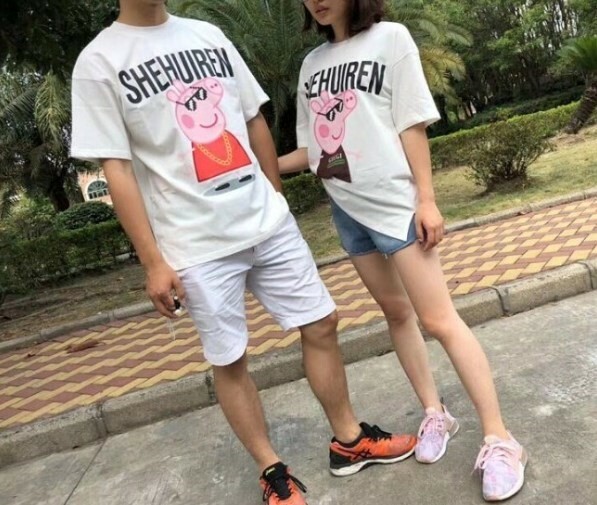 It’s these logos that have found their way onto numerous t-shirts on China’s Tmall, alongside other adult clothing that appropriates the kids’ cartoon. 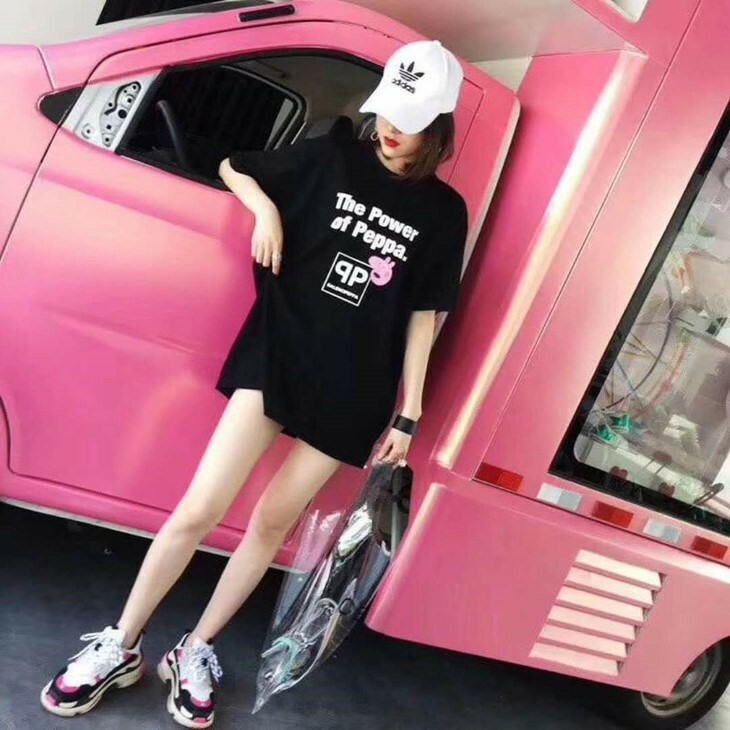 There are even t-shirts branded ‘Balencipeppa’ which borrow the fashion house’s ‘the power of dreams’ slogan, transforming it into ‘the power of Peppa’. Talk about ambitious crossovers. While all of this may seem bizarre (it is), there might be more to it than meets the eye. Like Winnie the Pooh, whose online presence was censored when it was used to mock Chinese authorities in 2017, Peppa Pig can act a subversive symbol of rebellion for those living under a restrictive regime. So, why Peppa? Articles on the Beijing Times website support the idea that it’s the display of wealth identified by Ah Pang that appeals. Moreover, as a kids’ TV character, Peppa is ambiguous re: political opinions (or any significant opinions besides jumping in mud). This means that the pink pig’s image is ripe for appropriation by pretty much anyone, regardless of their identity; rich kids can identify elements of their own lives in her bourgeois lifestyle, while lower-class kids can use it in turn to critique the superficial lives of the rich. It makes sense, then, that Peppa Pig and luxury fashion brands such as Chanel and Balenciaga have converged in such a big way. The ‘collaborations’ work just as well as an ironic comment on Shehuiren kids’ lack of social mobility as they do as a signifier of wealthier lifestyles. They’re memes created and proliferated by China’s digitally-savvy youth, rather than a trend hoisted on them by a brand or political ideology. This is perhaps where the meme’s curious longevity stems from. The power of Peppa is the power of the people.